Have you heard of FlyLady? I know she has been around for a few dozen years (I think my mom even did her when I was growing up) and I am just now putting into practice some of the techniques. What are the techniques? Well, they are kind of like Ma Ingall’s days of the week thing. (Remember? Wash on Monday, Iron on Tuesday, Mend on Wednesday and so on) Each room is your zone. Now, I have modified this to fit our current situation, schedule and whatnot. There is a more detailed arrangement that you can find on her site but I don’t have entry ways, multiple bedrooms, dining rooms and whatnot. I have 5. I have set it up that each week, 1 room gets a thorough cleaning. 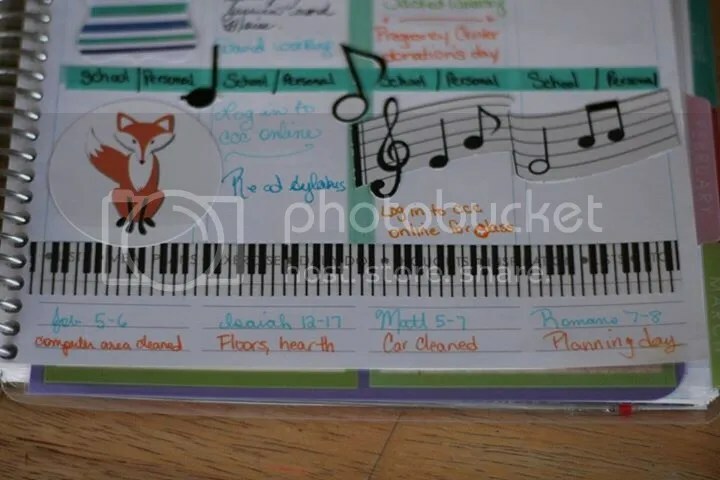 I use my hand dandy day planner to make it all laid out for me and scheduled nicely. Wanna see? I am so proud of my work here. 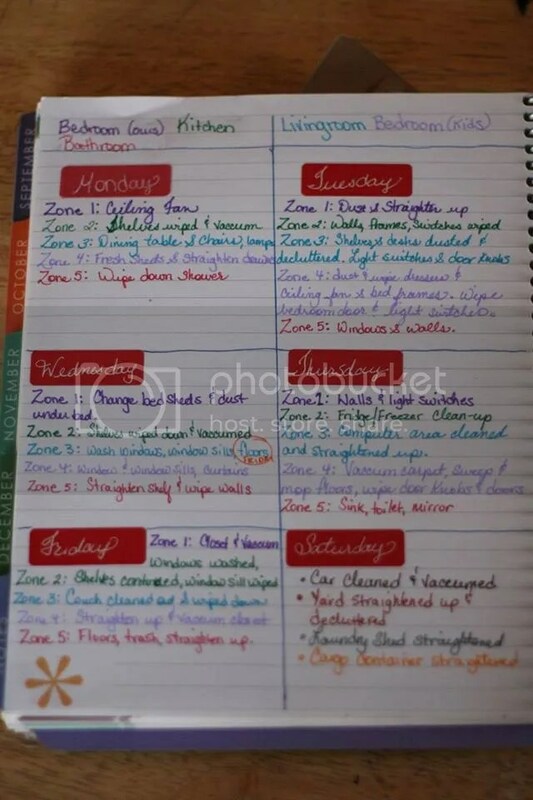 I break details down into 5 days and each day I pull a the items needing to do and write it down in my weekly view. I work from the back of the house, to the front to the back. I like to work from ceiling to floor. Today is Monday. I am starting in the children’s room. Zone 4. WE have stripped all the sheets and blankets off the beds. I will dust and clean ceiling fans so that no dust will land on freshly changed sheets before we put new sheets on the beds. Each day we will do another item and then at the end of the week we finish with vacuuming the carpet and mopping the floors. This is a good for those of us that have lots of “helpers” and never seem to accomplish anything outside of the care and tending of the children. What I like about this is that it generally takes me 10-15 minutes, Kitchen is maybe longer like 1/2 hour, and then that is it. I bet the first time will be a bit longer but that is ok! Start now. One of the reasons I love this system is that I am on top of clutter too. I can declutter each room once a month! So, for those ladies, mommies of all stages, that yearn for the home that looks maintained, not necessarily Better Homes and Gardens look but just maintained, I highly recommend finding a way to make this work for you. Start with a list (Computer might be best even if you are a paper and pen kind of gal. That way you won’t loose it and once your home is where you want it to be, then write it out! 😀 ) Break everything down into daily tasks that you think will take 10-15 minutes. If you have a large enough room/house where you know that realistically it will take you 30-45 minutes per day, then break it up into twice a day routine. I have even had to do this with my 10-15 minutes. Its ok! You notice I only have 5 days for my rooms. Saturdays are used for things like car clean out and washing (detail cleaning ie vacuum, wash, wipe down inside, etc) yard work (details, not the maintaining but the details!) garage (Cargo container for us) and the laundry shed. Those four items I do one per week and it works out to once a month cleaning for that. I also end this with a book recommendation. 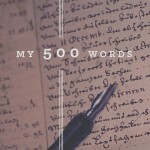 If you feel like you are drowning in stuff, know what the answer is but not really sure where to start, I would start with this encouraging book; it won’t tell you anything you don’t already know from numerous blogs, articles, etc but she is so encouraging and such an inspiration to me. 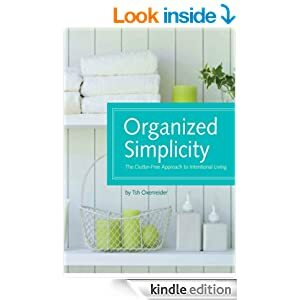 I very much recommend having Tsh Oxenreider’s book, Organized Simplicity.